Lessons in Leadership: The importance of culture, goal setting, and doing well by doing good. 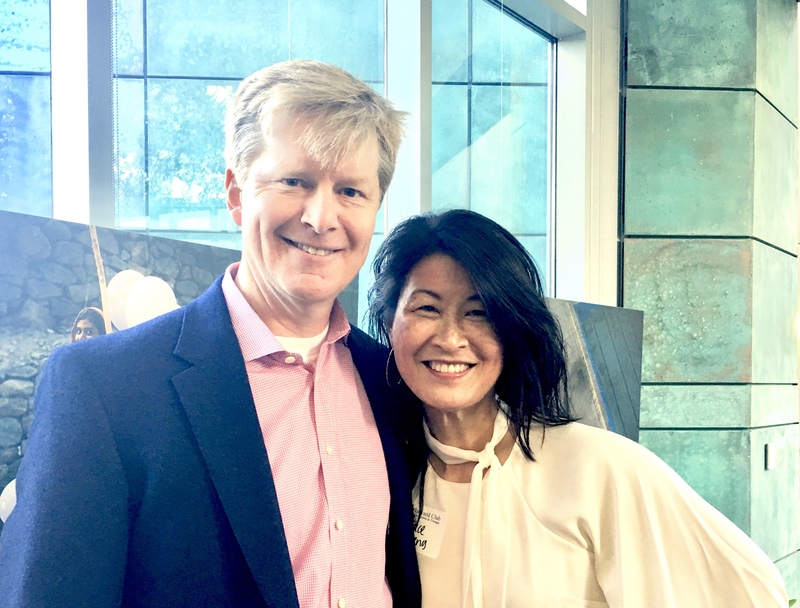 When the Harvard Club of the Research Triangle asked me to interview John Replogle for their Fall Business Breakfast, I immediately said yes. I met John a dozen years ago when he first moved to North Carolina to start his role as CEO of Burt’s Bees. A consumer marketer, I was one of Burt’s Bees biggest fans – I loved the natural products, the mission, the story of the founders. After my lunch with John, I quickly became a fan of his too. John led Burt’s Bees for five years growing revenues to $170 million at the time of the sale of the company to my former employer, Clorox for $925 million. He then joined another mission driven consumer products company, Seventh Generation, where he led as CEO for six years and grew annual revenues to $200 million at the time of acquisition of the company by Unilever, a former employer of his, for roughly $700 million in cash. John is well known for building positive cultures and teams and integrating positive psychology into his culture setting. A few years ago, I told John I was studying happiness with Tal Ben-Shahar, the creator of Harvard’s most popular course ever on happiness, as a part of an in-depth personal happiness journey. He recommended the book The Happiness Advantage by Shawn Achor, Tal’s teaching fellow. This book along with Tal’s course were foundational to my happiness studies. I’ve in turn incorporated positive psychology themes into my coaching practice. I share highlights of my conversation with John in the hopes of spurring new ideas for you. How did you grow as a leader as CEO of Burt’s Bees and then at Seventh Generation? How did Guinness and Unilever prepare you? Guinness and Unilever taught John how to run a business. They provided him with structure, development coaching, and really great mentors who contributed in major ways to the success of his career. Guinness invested in his growth and saw the value of his having good coaches. After six years at BCG, John started at Guinness in strategy and rose quickly, heading up US sales within a year. He had seven jobs in eight years and was constantly being pushed. He credits the company for throwing him into the deep end and pushing his leadership boundaries, with experienced mentors as guides. The roots of caring ran deep in the Guinness family and their values – Power, Goodness, and Community – were strong foundational blocks. Their values drove the desire to create a great brand. And that attracted strong people. But for John, work and mission were 2 very separate things at Guinness. John volunteered and tried to do good outside of work. The dissonance became so loud that at one point he had a ‘spear in the chest’ moment – when it became very clear to him that what he was doing every day was not serving his purpose. It was a dramatic moment for him and his family. So he decided to leave Guinness, and move to a place where his purpose and his work were better aligned. This led him to Unilever where he worked on many meaningful initiatives including the Campaign for Real Beauty (John and his wife Kristin have 4 daughters) as GM for Unilever’s North American skin care division. At Guinness and Unilever, John led as President and then GM of divisions of big corporations. He had set his goals early on that he wanted to become a CEO. It was around this time, however, that he came to realize he did not want to be a public company CEO. That, along with his desire to do well by doing good, made the chance to become CEO of Burt’s Bees an attractive move. Burt’s was the first time where his work and mission truly came together. His first CEO gig involved several big shifts. For the first time, John reported to a board instead of an individual, so he had to learn how to lead and govern in this new setting. Secondly, moving from a corporate setting to a private equity backed setting had its own set of learnings. Finally, following a founder was incredibly challenging. Founders are powerful, thoughtful and visionary and so much of their persona is infused in the culture and the way the business is run. How could he take this really great company with purely entrepreneurial processes that broke all the rules, and bring in a foundation of structure and processes for growth without killing the heart and soul of the company? How could he maintain its funky and cool vibe while getting the company smarter and more efficient? A lot of people had been there a long time. What was the best way to bring in people with more traditional corporate backgrounds and fuse them together with the entrepreneurs so as not to have an old and a new? How would he create one culture? His biggest growth challenge was figuring out how to maintain the culture the founders at both companies had created. He invested much time on it. And as a result, why he is now so well known for his inspirational leadership and positive culture creation. (see If you want your company to flourish, start with your workers). Chuck Swoboda, the former CEO of Cree, told me recently how you add great value to the Cree board. What do you enjoy the most about board service? the least? and what experiences do you think have given you the intuitive ability to be a valuable board director? John views serving on boards like being a grandparent, you can have fun and then give the children back to the parents. The part he likes the least is serving on audit committee. He was attracted to Cree because (1) he had a good relationship with Chuck and knew he was a bright guy (2) they were highly innovative, and more and more of what they were doing offered environmental benefits: LED lighting and creating chip technology that is fueling electric vehicles. Tesla runs with Cree and every major EV company is going to integrate Cree into their power systems, to maximize efficiency and battery life. Cree is at the sweet spot of all this. (3) Huge IP technology and semiconductors was a space he knew nothing about. This third point really attracted John. Providing the opportunity to grow by learning about a new category and its dynamics has proven to be a wonderful challenge for him. As a board member, John said that he leads by listening. He takes the tools he learned as a consultant of stepping back and listening. Then he connects different dots to bring new insights that, maybe because management is so close to the glass, they can’t see. Every time John is in a boardroom, he tries to listen, synthesize, and offer a perspective that perhaps management hasn’t thought of yet. I love your quote “service is the rent we pay for the privilege of living on this planet” and how you combine service into your work. How did you concept One Better Ventures? John found this phrase in a fortune cookie and pinned it above his desk for years. He kept asking himself “What’s my service?” “How am I paying rent?” His answer was building leading teams that are doing good and serving as role models. Burt’s Bees has the Greater Good Model that reinforces the triple bottom line. Burt’s was the first manufacturer in North Carolina to be waste free. They then taught their parent company Clorox, whose manufacturing plants are now also zero waste to landfill. Seventh Generation along with Patagonia are founding Benefit Corporation members. John continues to serve on the social mission board at Seventh Generation. In recent years, John began to think “Instead of moving one rock, how can we move many rocks? How can we go wide rather than deep?” With colleagues from Burt’s Bees and Seventh Generation, he founded One Better Ventures to inspire entrepreneurs to use business as a force for good. He and his four partners advise and invest. They’ve found good demand for their model and what they offer. They would like their center of gravity to remain in the Triangle and create a consumer movement here. What is your advice to those who are starting companies and want to do well by doing good? How has conscious capitalism impacted your work? John has spoken on campuses throughout the US to students who aspire to be entrepreneurs and do some good. He believes we are fundamentally living in a really challenged world on so many dimensions. Capitalism has been an incredibly powerful way to lift people out of poverty to create better opportunities, better standards of living, better health, and longer lives. That said, the consequences of capitalism internalizing profits and externalizing all of the costs are unsustainable. One hundred years of burning carbon and externalizing other pollutants are causing irreparable damage to our biosphere and human health. John believes that we can’t live a healthy life on a sick planet. He said that we have to change the model, the economics. It’s not going to happen exclusively through government. Yes, good policy is important, but the change must ultimately come through business. The U.S. economy is a $28 trillion market of which business is the largest slice at $22 trillion. Non-profits are only $1 trillion. If you really want to devote your life to service, he encourages serving through business. Figure out how you can serve through business and make that your outlet. Business is the most powerful force on earth. How can we harness the power of business to change the trajectory? To have positive impact? Via the triple bottom line to serve people, planet, and profits and in that order. His fundamental belief is that if you serve people and the planet, profits will follow. He is now spending a lot of his time coaching entrepreneurs who believe that business is a force for good. North Carolina currently has 50 certified B Corporations. His goal is to get to 100 by 2020. U.N. reports released this month state that we have 12 years to avert a climate related catastrophe. John spoke of using business to drive pace and scale to make positive change. Entrepreneurs just do it. He encouraged that if you have passion, an idea, to pursue it. He considers now the “golden age of entrepreneurship” with more and more avenues of social capital, networked services, and shared working environments that are rich with resources for startups that want to do well by doing good. He believes that grassroots entrepreneurs will create the coming decades of capital growth by driving systems change and by causing market disruptions. I have checked out Leesa – a direct to consumer mattress company you’ve invested in and its One-Ten programto donate one mattress for every ten sold, with over 30,000 mattresses donated to date. Tell me your thoughts on market disruptors. I’d love your take on why you think they are occurring. It’s such a wonderful time to be an entrepreneur and to think and act differently. Connectivity and social channels have turned classic marketing on its head. The way we used to build brands was through television, the only channel for real mass appeal, very expensive and sown up by the major players. Tesla couldn’t disrupt GM because GM could outspend them 500 to 1. Seventh Generation couldn’t compete against Procter & Gamble because P&G could outspend us 10 million to 1. The control vehicle was reaching mass audiences. That has been completely democratized as has access to capital. This has created more entrepreneurship. Disruption occurs where you can meet an unmet consumer need. Find the unmet consumer need and solve it, then you can disrupt anything. With Leesa Sleep – the disruptive idea is that up until 5 years ago, almost 100% of mattresses were bought in stores. 98% of consumers had a terrible experience with salespeople who were like those in used car sales. They would walk in thinking to spend $1K and spent $2K and never felt good about it. A terrible model. Mattress manufacturers never had a relationship with the consumer. Along come direct to consumer brands and flipped the model on its head. We can go beyond simply selling a mattress and offer a better night’s sleep, we build a better experience. We can offer a 100-day trial versus 2 minutes in a store. We can bring costs down and offer a $2-3K mattress for under $1K. Find the unmeet need and address it in a new and innovative way. The mattress is better, but the revolution is the service. Going from a transaction based business to a relational based business. Years ago, at another Harvard event you talked about your goal setting process and I’ve heard you cite the research that if you write down your goals achievement increases by 50% and if you tell someone it rises to 75%. I often tell my coaching clients this to encourage them to carefully think through their goals and then I partner with them in the journey. Your goal setting has taken you to many interesting places. What have been the keys to your diligence in goal setting? What is still on your list – can you share with us what goals do you have for the coming decades? Like Pavlov’s dog, if you get a treat from something you do, you want to do it again. John started setting goals at an early age. When you set goals and achieve, you realize setting goals is a good thing. On campuses, John talks about 2 fundamental things. (1) Know yourself and define your purpose. Get really clear on what it is you’re here for what’s your calling. Where is it that your great gifts meet the world’s great needs? Define that. (2) Determine goals – the fuel that goes in the tank of your purpose. Write down goals and share where you can. John sets monthly, annual, and five-year goals. He has had good coaches who hold him accountable. He sits down every year the week between Christmas and New Year’s and has a deep review and critical assessment of this year’s goals. He spends 90 minutes on the phone with his coach. He has it scheduled and knows when it is they are going to talk. John knows that he will be held accountable. This is the time of year he pulls his sheet out assessing where he is and focuses on moving forward those that are behind, otherwise he knows that the end of year conversation will be challenging. He also spends time crafting goals for the coming year. He believes goals are so powerful when you set them. Goal oriented leaders achieve more. John shared that he has always had a high need to achieve, that it is part of his composition. Goals have served as a major tool. In thinking through his goals, John shifted gears and left Seventh Generation. With two of his four daughters left in the nest, he wants to devote more time back here with family and the Triangle. Commuting for 7 years to Vermont, John lost a lot of the connection and the joy being involved in the community brought him. He is looking to restore that. He’d like to see One Better Ventures have a positive impact in creating a powerful community of mission driven consumer companies. John would also like to contribute to some broader issues. Along with 140 CEOs in North Carolina, he is involved with BEST NC as he believes education is the entry way to the American dream. At some point, he’d like to find another outlet for service. He shared that his pocket aspiration is he’d like to run for Governor. He has my vote when that happens. Grace Ueng is Founder & CEO of Savvy Growth, whose mission is to help companies and their leaders achieve their fullest potential. Founded in 2003 as Savvy Marketing Group to advise clients on marketing strategy and their personal branding, her firm now also offers management consulting and leadership coaching. Her firm has served 200 clients from emerging growth to the Fortune 1000. View 2 min introduction to Savvy Growth.